Mark Perry of the American Enterprise Institute is most famous for his Venn diagrams that expose hypocrisy and inconsistency. But he also is famous for his charts. 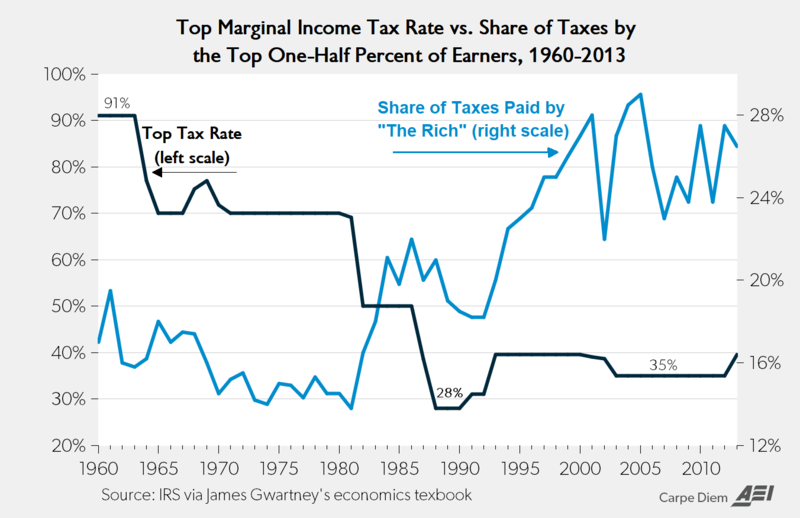 And since I’m a big fan of sensible tax policy and the Laffer Curve, we’re going to share Mark’s new chart looking at the inverse relationship between the top tax rate and the share of taxes paid by the richest Americans. Examining the chart, it quickly becomes evident that upper-income taxpayers started paying a much greater share of the tax burden after the Reagan tax cuts. My left-leaning friends sometimes look at this data and complain that the rich are paying more of the tax burden only because they have grabbed a larger share of national income. And this means we should impose punitive tax rates. But this argument is flawed for three reasons. First, there is not a fixed amount of income. The success of a rich entrepreneur does not mean less income for the rest of us. Instead, it’s quite likely that all of us are better off because the entrepreneur created some product of service that we value. Indeed, data from the Census Bureau confirms that all income classes tend to rise and fall simultaneously. Second, it’s not even accurate to say that the rich are getting richer faster than the poor are getting richer. 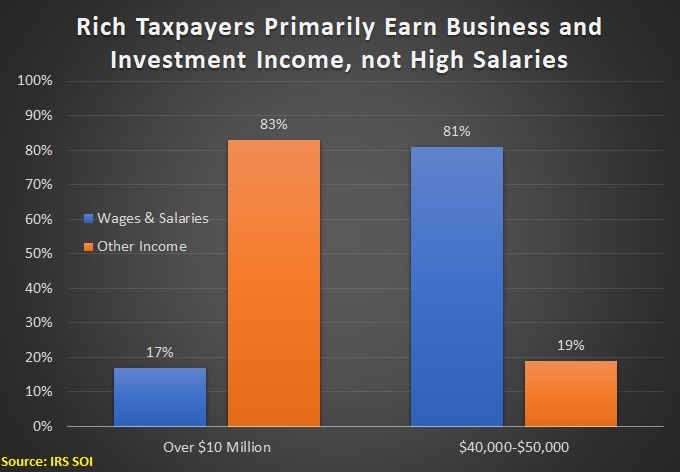 Third, one of the big fiscal lessons of the 1980s is that punitive tax rates on upper-income taxpayers backfire because investors, entrepreneurs, and business owners will choose to earn and report less taxable income. For my contribution to this discussion, I want to elaborate on this final point. When I give speeches, I sometimes discover that audiences don’t understand why rich taxpayers can easily control the amount of their taxable income. And I greatly sympathize since I didn’t appreciate this point earlier in my career. That’s because the vast majority of us get the lion’s share of our income from our employers. And when we get this so-called W-2 income, we don’t have much control over how much tax we pay. And we assume that this must be true for others. But rich people are different. If you go the IRS’s Statistics of Income website and click on the latest data in Table 1.4, you’ll find that wages and salaries are only a small fraction of the income earned by wealthy taxpayers. These high-income taxpayers may be tempting targets for Alexandria Ocasio-Cortez, Elizabeth Warren, Bernie Sanders and the other peddlers of resentment, but they’re also very elusive targets. That’s because it’s relatively easy – and completely legal – for them to control the timing, level, and composition of business and investment income. When tax rates are low, this type of tax planning doesn’t make much sense. But as tax rates increase, rich people have an ever-growing incentive to reduce their taxable income and that creates a bonanza for lawyers, accountants, and financial planners. Needless to say, there are many loopholes to exploit in a 75,000-page tax code. P.S. There’s some very good evidence from Sweden confirming my point. 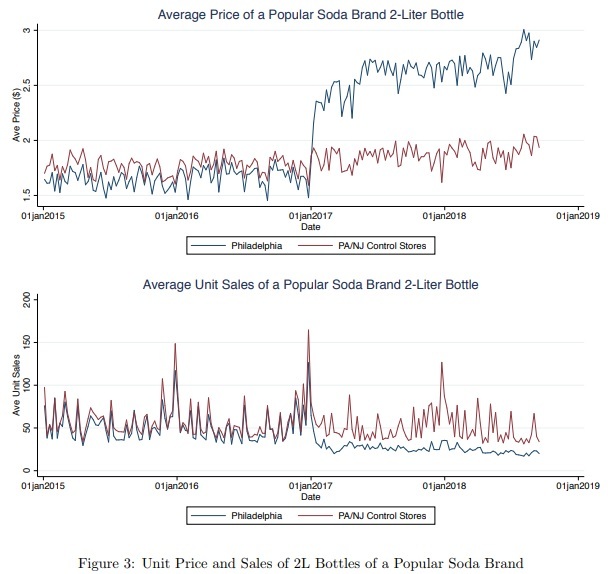 We analyze the impact of a tax on sweetened beverages, often referred to as a “soda tax,” using a unique data-set of prices, quantities sold and nutritional information across several thousand taxed and untaxed beverages for a large set of stores in Philadelphia and its surrounding area. We find that the tax is passed through at a rate of 75-115%, leading to a 30-40% price increase. Demand in the taxed area decreases dramatically by 42% in response to the tax. 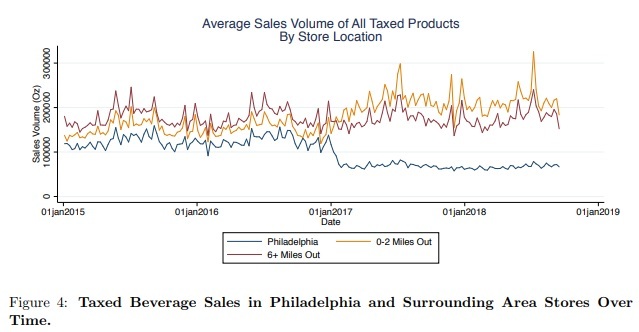 There is no significant substitution to untaxed beverages (water and natural juices), but cross-shopping at stores outside of Philadelphia completely o↵sets the reduction in sales within the taxed area. As a consequence, we find no significant reduction in calorie and sugar intake. Like most taxpayer-supported international bureaucracies, the Organization for Economic Cooperation and Development (OECD) has a statist orientation. The Paris-based OECD is particularly bad on fiscal policy and it is infamous for its efforts to prop up Europe’s welfare states by hindering tax competition. It even has a relatively new “BEPS” project that is explicitly designed so that politicians can grab more money from corporations. So it’s safe to say that the OECD is not a hotbed of libertarian thought on tax policy, much less a supporter of pro-growth business taxation. Which makes it all the more significant that it just announced that supporters of free markets are correct about the Laffer Curve and corporate tax rates. The OECD doesn’t openly acknowledge that this is the case, of course, but let’s look at key passages from a Tuesday press release. Taxes paid by companies remain a key source of government revenues, especially in developing countries, despite the worldwide trend of falling corporate tax rates over the past two decades… In 2016, corporate tax revenues accounted for 13.3% of total tax revenues on average across the 88 jurisdictions for which data is available. This figure has increased from 12% in 2000. 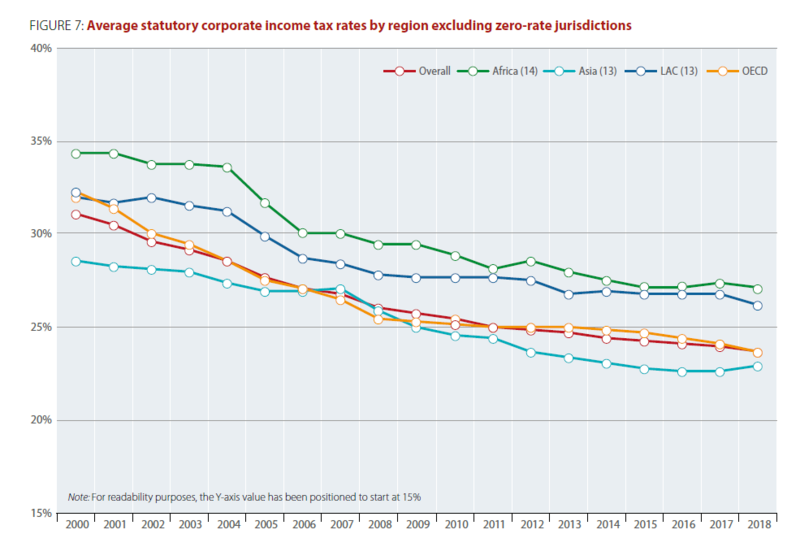 …OECD analysis shows that a clear trend of falling statutory corporate tax rates – the headline rate faced by companies – over the last two decades. The database shows that the average combined (central and sub-central government) statutory tax rate fell from 28.6% in 2000 to 21.4% in 2018. So tax rates have dramatically fallen but tax revenue has actually increased. I guess many of the self-styled experts are wrong on the Laffer Curve. By the way, whoever edits the press releases for the OECD might want to consider changing “despite” to “because of” (writers at the Washington Post, WTNH, Irish-based Independent, and Wall Street Journal need similar lessons in causality). Let’s take a more detailed look at the data. Here’s a chart from the OECD showing how corporate rates have dropped just since 2000. Pay special attention to the orange line, which shows the rate for developed nations. I applaud this big drop in tax rates. It’s been good for the world economy and good for workers. And the chart only tells part of the story. 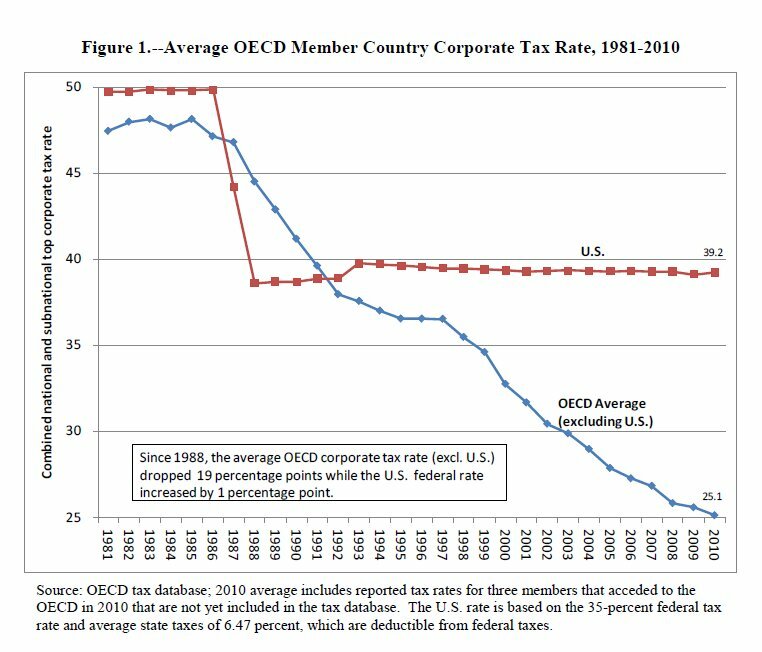 The average corporate rate for OECD nations was 48 percent back in 1980. In other words, tax rates have fallen by 50 percent in the developed world. Yet if you look at this chart, which I prepared using the OECD’s own data, it shows that revenues actually have a slight upward trend. I’ll close with a caveat. The Laffer Curve is very important when looking at corporate taxation, but that doesn’t mean it has an equally powerful impact when looking at other taxes. It all depends on how sensitive various taxpayers are to changes in tax rates. Business taxes have a big effect because companies can easily choose where to invest and how much to invest. The Laffer Curve also is very important when looking at proposals (such as the nutty idea from Alexandria Ocasio-Cortez) to increase tax rates on the rich. That’s because upper-income taxpayers have a lot of control over the timing, level, and composition of business and investment income. But changes in tax rates on middle-income earners are less likely to have a big effect because most of us get a huge chunk of our compensation from wages and salaries. Similarly, changes in sales taxes and value-added taxes are unlikely to have big effects. Increasing those taxes is still a bad idea, of course. I’m simply making the point that not all tax increases are equally destructive (and not all tax cuts generate equal amounts of additional growth). P.S. The International Monetary Fund also accidentally provided evidence about corporate taxes and the Laffer Curve. And there was also a little-noticed OECD study last year making the same point. But “very sensible” is not the same as “totally sensible.” Especially not if you count recent years. Here are some excerpts from a story in the Globe and Mail. The Liberal government’s tax on Canada’s top 1 per cent failed to produce the promised billions in new revenue in its first year, as high-income earners actually paid $4.6-billion less in federal taxes. …The latest available tax records show that revenue from Canadians earning about $140,000 or more – which had previously been the fourth and highest tax bracket – dropped by $4.6-billion in 2016, the first full year that the Liberal tax changes were in effect. Further, 30,340 fewer Canadians reported incomes in that range for 2016 compared with the year before. …The new top bracket with a 33-per-cent tax rate was predicted to raise about $3-billion a year in new revenue… Critics of the Liberal plan say the CRA’s 2016 numbers justify their concern that a new top tax bracket hurts Canadian efforts to boost competitiveness and attract top talent. 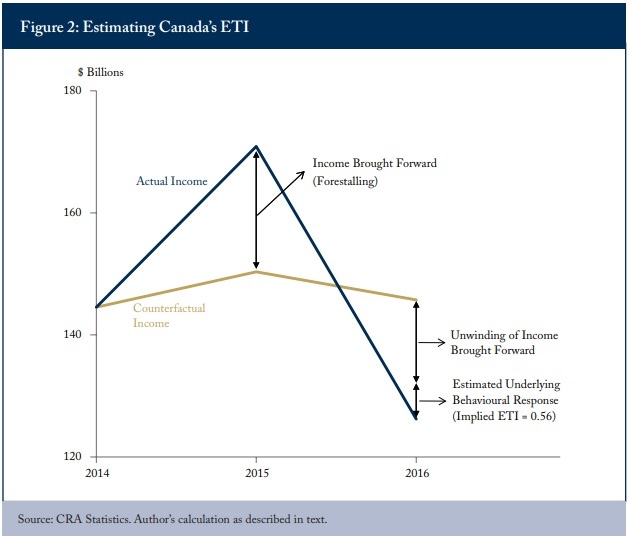 The Liberal government’s 2016 tax hike on Canada’s top one per cent not only failed to yield the promised billions, but resulted in a net revenue loss for government coffers… After adjusting for economic changes and one-time factors, the paper estimates, based on 2016 tax data, that the Liberals’ new tax bracket for top earners creates $1.2 billion in new revenue for the federal government but a $1.3 billion loss for provincial governments. …Finance Minister Bill Morneau’s office, however, has maintained that the revenue drop for 2016 was a one-off event. …But an analysis of the data that adjusts for the impact of the dividends maneuver and economic factors still shows that the tax hike would have fallen far short of the hype… Studies have shown that top earners are more likely than lower-income taxpayers to react to tax increases by reducing their taxable income. This may be because the wealthy have access to more sophisticated tax advice, are more easily able to shift assets to lower-tax jurisdictions or can afford to simply decide to work less given that they get to keep less of their money. 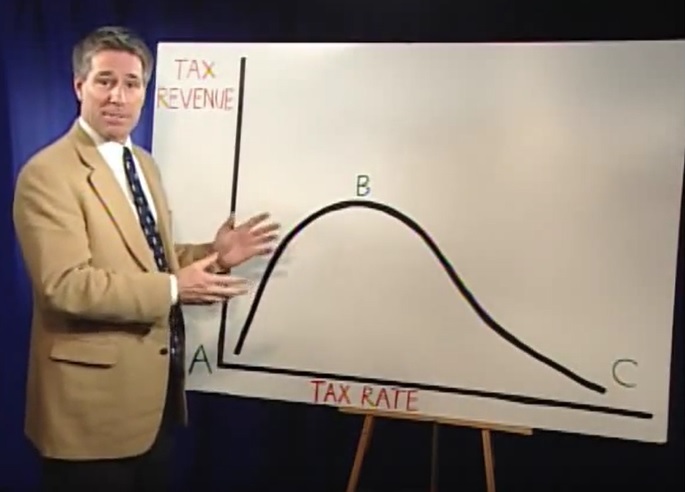 As illustrated by this video tutorial, I’m a big advocate of the Laffer Curve. I very much want to help policy makers understand (especially at the Joint Committee on Taxation) that there’s not a linear relationship between tax rates and tax revenue. In other words, you don’t double tax revenue by doubling tax rates. Having worked on this issue for decades, I can state with great confidence that there are two groups that make my job difficult. The folks who don’t like pro-growth tax policy and thus claim that changes in tax policy have no impact on the economy. The folks who do like pro-growth tax policy and thus claim that every tax cut will “pay for itself” because of faster growth. Which was my message in this clip from a recent interview. For all intents and purposes, I’m Goldilocks in the debate over the Laffer Curve. Except instead of stating that the porridge is too hot or too cold, my message is that it is that changes in tax policy generally lead to more taxable income, but the growth in income is usually not enough to offset the impact of lower tax rates. In other words, some revenue feedback but not 100 percent revenue feedback. Yes, some tax cuts do pay for themselves. But they tend to be tax cuts on people (such as investors and entrepreneurs) who have a lot of control over the timing, level, and composition of their income. 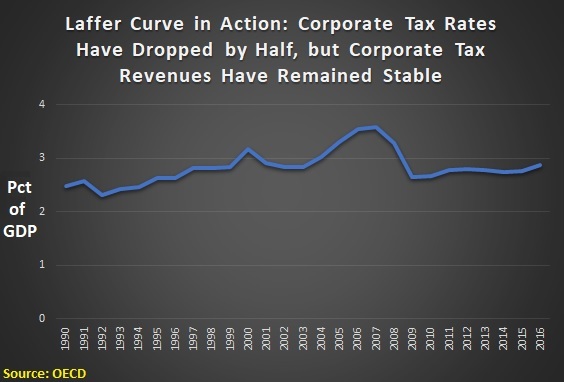 And, as I said in the interview, I think the lower corporate tax rate will have substantial supply-side effects (see here and here for evidence). This is because a business can make big changes in response to a new tax law, whereas people like you and me don’t have the same flexibility. But I don’t want this column to be nothing but theory, so here’s a news report from Estonia on the Laffer Curve in action. After Estonia raised its alcohol excise tax rates considerably in 2017, Estonian daily Postimees has estimated that the target of the money the alcohol excise tax would bring into state coffers could have been missed by at least EUR 40 million. …Initially, in the state budget of 2017, the ministry had been planned that proceeds from the alcohol excise tax would bring EUR 276.4 million, but last summer, it cut the forecast to EUR 237.5 million. I guess I’ll make this story Part VII in my collection of examples designed to educate my friends on the left (here’s Part I, Part II, Part III, Part IV, Part V, and Part VI). But there’s a much more important point I want to make. The fact that most tax increases produce more revenue is definitely not an argument in favor of higher tax rates. That argument is wrong in part because government already is far too large. But it’s also wrong because we should consider the health and vitality of the private sector. Here’s some of what I wrote about some academic research in 2012. …this study implies that the government would reduce private-sector taxable income by about $20 for every $1 of new tax revenue. Does that seem like good public policy? Ask yourself what sort of politicians are willing to destroy so much private sector output to get their greedy paws on a bit more revenue. What about capital taxation? According to the second chart, the government could increase the tax rate from about 40 percent to 70 percent before getting to the revenue-maximizing point. But that 75 percent increase in the tax rate wouldn’t generate much tax revenue, not even a 10 percent increase. So the question then becomes whether it’s good public policy to destroy a large amount of private output in exchange for a small increase in tax revenue. Once again, the loss of taxable income to the private sector would dwarf the new revenue for the political class. The bottom line is that I don’t think it’s a good trade to reduce the private sector by any amount simply to generate more money for politicians. P.S. I’m also Goldilocks when considering the Rahn Curve. P.P.S. For what it’s worth, Paul Krugman (sort of) agrees with me about the Laffer Curve. Last month, I revealed that even Paul Krugman agreed with the core principle of the Laffer Curve. Today, we have another unlikely ally. Regular readers know that I’m not a big fan of the Organization for Economic Cooperation and Development. The Paris-based international bureaucracy routinely urges higher tax burdens, both in the United States and elsewhere in the world. But the professional economists who work for the OECD are much better than the political appointees who push a statist agenda. So when I saw that three of them (Oguzhan Akgun, David Bartolini, and Boris Cournède) produced a study estimating the relationship between tax rates and tax revenues, I was very curious to see the results. They start by openly acknowledging that high tax rates can backfire. This paper investigates the capacity of governments to raise revenue by assessing the ways in which tax receipts respond to rates… Revenue returns from tax increases can be expected to decrease with the level of tax rates, because higher rates exacerbate disincentives to produce and raise incentives to avoid taxation. These two main channels can therefore imply that tax receipts rise less than proportionately with rates and may peak at a given point. Given the OECD’s love affair with higher tax burdens, this is a remarkable admission about an important limit on the ability of governments to grab revenue. Their estimate of the actual revenue-maximizing burden is almost secondary. But nonetheless still noteworthy. According to the estimated coefficients in model 5 of Table 3, an EMTR of 25% maximises CIT revenue. Not that different from the estimates produced at the Tax Foundation and American Enterprise Institute. Here’s a chart showing the revenue-maximizing level of tax, which varies depending on the degree to which a country has close economic ties with the rest of the world. Interestingly, the study openly admits that tax competition plays a big role. 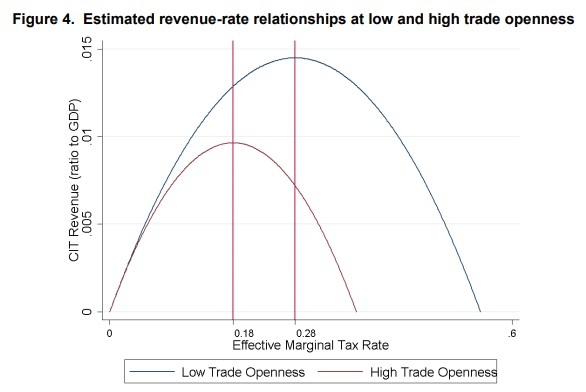 Trade openness is found to reduce CIT revenue. The latter is consistent with…international tax competition, which is likely to increase the effects of tax rates on the location of firms or more broadly of their profit-generating activities. Sadly, the political types at the OECD have a “BEPS” scheme that is designed to curtail tax competition. Which is a very good argument for why tax competition should be allowed to flourish. But let’s not digress. Here’s another remarkable admission in the study. The OECD economists point out that it is not a good idea for governments to try to maximize revenue. Estimates of revenue-maximising rates should not be seen as policy objectives or recommendations, as they imply high levels of economic distortions or tax avoidance. Amen. I cited a study in 2012 showing that a revenue-maximizing tax rate might destroy as much as $20 of private sector output for every $1 collected by government. Only Bernie Sanders would think that’s a good deal. Last but not least, the study even points out a class-warfare approach is misguided when looking at personal income taxes. More progressive broadly defined personal income taxes generally yield more revenue, but very strong progressivity is associated with lower revenue. The bottom line is that high tax rates of any kind are not a good idea. P.S. The International Monetary Fund inadvertently provided very strong evidence about the Laffer Curve and corporate taxes. P.P.S. An occasional good study doesn’t change my belief that the OECD no longer should be subsidized by American taxpayers. 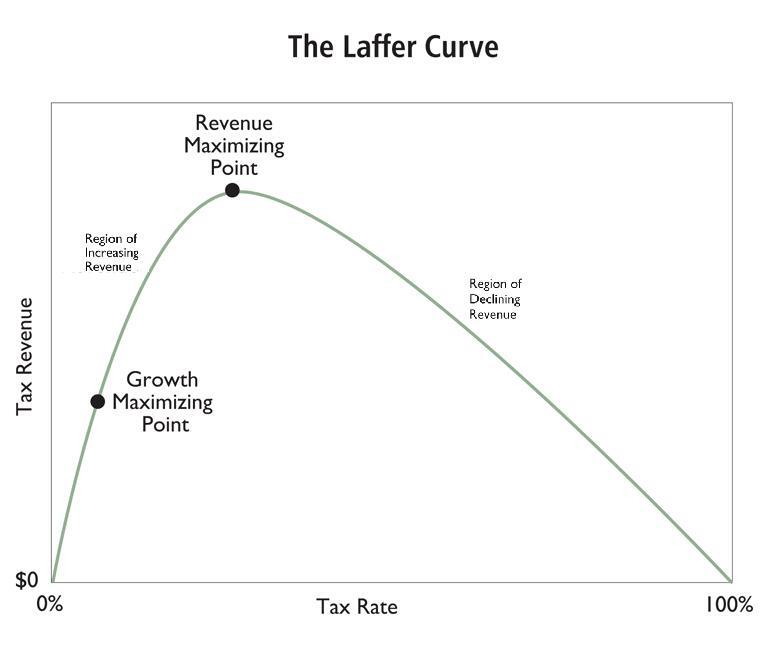 I’ve been writing about the Laffer Curve for decades, making the simple point that there’s not a linear relationship between tax rates and tax revenue. To help people understand, I ask them to imagine that they owned a restaurant and decided to double prices. Would they expect twice as much revenue? Of course not, because people respond. Customers would go to other restaurants, or decide to eat at home. Depending on how customers reacted, the restaurant might even wind up with less revenue. Well, that’s how the Laffer Curve works. When tax rates change, that alters incentives to engage in productive behavior (i.e., how much income they earn). In other words, to figure out tax revenue, you have to look at taxable income in addition to tax rates. For some odd reason, this is a controversial issue. Wow, that’s pretty damning. Economists from Stanford, Harvard, MIT, and the University of Chicago are on the other side of the issue. Should I give up and retract all my writings and analysis? Fortunately, that won’t be necessary since I have an unexpected ally. As shown in this excerpt from the video, Paul Krugman agrees with me about the Laffer Curve. And Krugman’s not alone. Many other left-leaning economists also admit there is a Laffer Curve. To be sure, as Krugman noted, there is considerable disagreement about the revenue-maximizing tax rate. Folks on the left often say tax rates could be 70 percent while folks on the right think the revenue-maximizing rate is much lower. I have two thoughts about this debate. First, if the revenue-maximizing rate is 70 percent, then why did the IRS collect so much additional revenue from upper-income taxpayers when Reagan lowered the top rate from 70 percent to 28 percent? Second, I don’t want to maximize revenue for government. That’s why I always make sure my depictions of the Laffer Curve show both the revenue-maximizing point and the growth-maximizing point. At the risk of stating the obvious, I prefer the growth-maximizing point. The bottom line is that I think the revenue-maximizing point is probably closer to 30 percent, as shown in my chart. Especially in the long run. But I wouldn’t care if the revenue-maximizing rate was actually 50 percent. Politicians should only collect the relatively small amount of revenue that is needed to finance the growth-maximizing level of government spending. P.S. As tax rates get closer and closer to the revenue-maximizing point, that means an increasing amount of economic damage per dollar collected. P.P.S. Paul Krugman is also right that value-added taxes are not good for exports. Addendum: This post was updated on August 12 to add the clip of selected economists mocking the Laffer Curve.